The easier the recipe, the better, at least in my books! Breakfast casseroles are one of my fave types of recipes to wake up to. You can start the prep work the night before and finish the next day. They are filling and great to serve when you have company over. I’ve made many varieties of breakfast casseroles in the past, but this was my first time using cinnamon buns as a base. 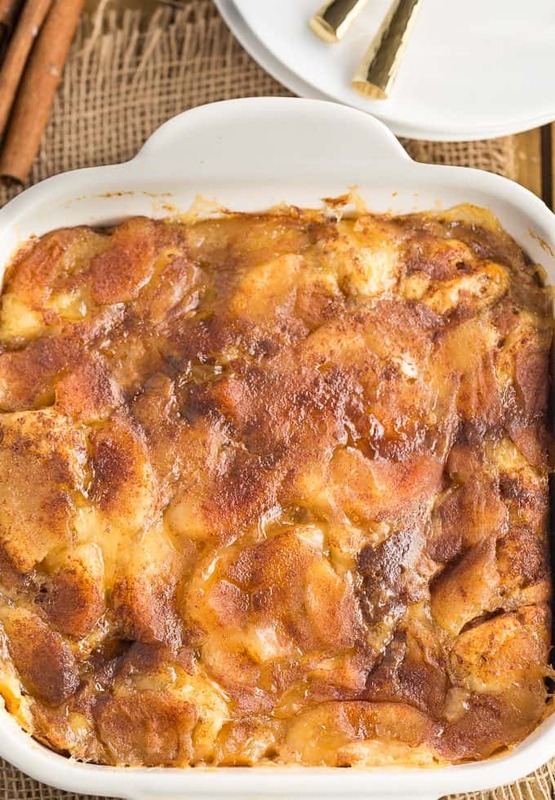 Meet the Apple Cinnamon Bun Breakfast Casserole. Save time and use refrigerated cinnamon buns. I also used canned apple pie filling to keep things easy peasy. It’s bound together by a creamy egg mixture and bakes to a perfect golden brown. You don’t even need any extra toppings because it’s sweet enough on its own. Yes, it’s almost like a dessert! If you wanted to serve it for dessert, you could. I prefer it first thing in the morning though as a sweet treat to wake up to. It smells so good while it’s baking in the oven. 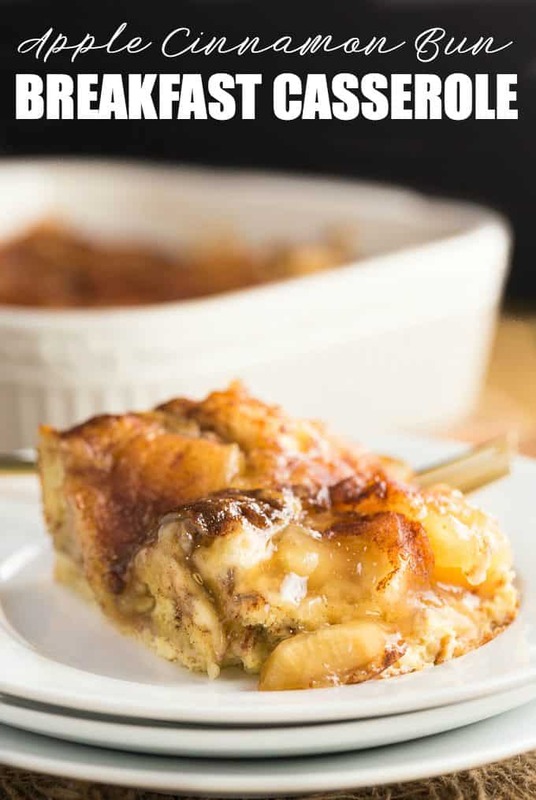 Check out my other breakfast casserole recipes including Sausage & Butternut Squash Breakfast Casserole, Banana Bread Breakfast Casserole, Strawberry & Coconut Breakfast Casserole and the ever popular, Wife Saver Breakfast. You might also like this Apple Cake with Butterscotch Sauce. I’m always looking for new ways to make breakfast casseroles. Any suggestions on what I should try next? A sweet way to start your day and feed your guests! 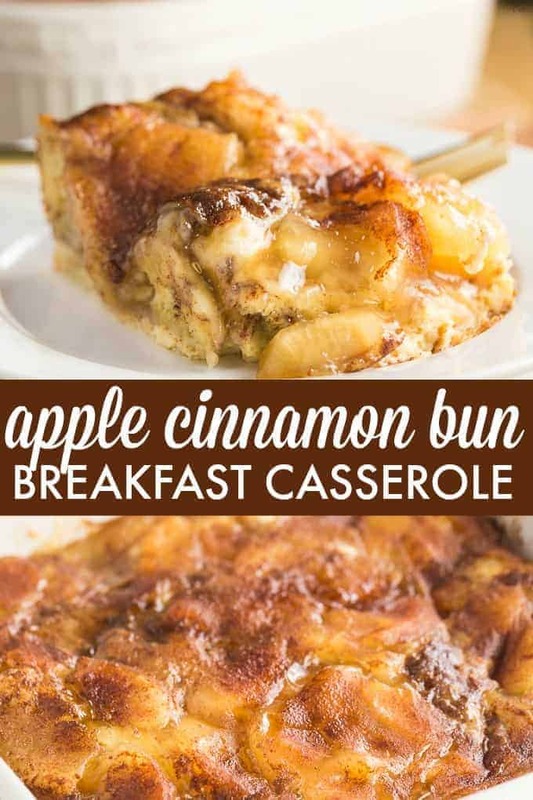 It’s made with cinnamon buns + apple pie filling for a mouthwatering breakfast casserole you’ll make again and again. Preheat oven to 350F. Spray a 1.5 quart casserole dish with cooking spray. Cut up cinnamon rolls into bite sized pieced and spread evenly on the bottom of the casserole dish. Spread apple pie filling evenly over top of the cinnamon rolls. In a large mixing bowl, whisk together milk, eggs, salt, vanilla extract and cinnamon. Pour over top of the apple pie filling. To make the topping, stir together brown sugar and cinnamon in a small bowl. Sprinkle over top of the egg mixture. Cover. Bake for 30 minutes, covered. Then remove the cover and bake an additional 30 minutes or until egg mixture is set. Serve hot. This sounds so delicious. I bet this would very quickly become a family favorite. This would be fantastic for our next brunch – thanks! I need to make 10 large servings …. If I tripled this recipe would that make enough ? what size casserole dish would I need do you think ? This is going to be such a wonderful surprise for the family !! Thank You for any advise & help you can give me. Yes, tripling it you should have more than enough! I would use a 9×13 pan if you are doubling the recipe. Tripling it, use the 9×13 and the square pan unless you have a bigger dish than a 9×13, then use that. Thank You so much for the advise !! Can this dish be frozen after it is baked? I would like to make it for a bake sale. I’m sure it would be ok! yummy; might just make this for our Christmas morning break. thanks for sharing. This sounds amazing. Now if I were working I would bring this for our get-togethers. It would disappear in a minute. This recipe looks amazing. I can’t wait to try it. I wanted to let you know that you are one of my Featured Picks this week at https://www.farmhouse40.com/inspire-me-monday-157. Come check it out. 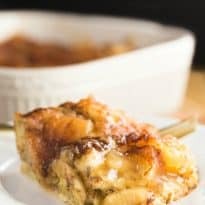 I just pinned your awesome Breakfast Casserole! Thanks so much for sharing with us at our Thanksgiving Edition of Full Plate Thursday! Hope you have a great week and come back soon! Oh my, I can’t wait to try this recipe. It sounds easy to make and hard to mess up. Thank you for sharing it at Snickerdoodle. Would make the house smell like cinnamon, wonderfu! This is such a wonderful recipe. Thanks so much. DELICIOUS! Apple and cinnamon is one of my favourite combos! Do you think I can make this the night before and bake in the morning? Any suggestions for reheating when needed? You could reheat in the microwave or in the oven for 15 to 20 minutes.